Puntos Necesarios: 1450 Tenga en cuenta que, de momento, no se puede descargar contenido de nuestra plataforma directamente en un dispositivo móvil (teléfono, iPod, iPad, tabletas ...). Necesitas descargar sus artículos en un PC o Mac y, a continuación, transferirlos a su dispositivo de forma normal. Estamos trabajando para permitir que las descargas directas a los dispositivos móviles, pero esto no es posible en la versión actual de la plataforma. Perdón por las molestias! 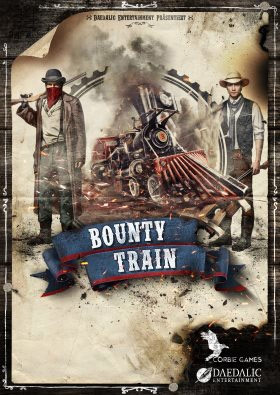 NOTICE: Requires the base game Bounty Train in order to play. Activation key must be used on a valid Steam account. Requires internet connection. About the gameWith Bounty Train – NEW WEST Walter Reed's story continues after the events of the base campaign. Take control over your company and lead the building process of your new facility, move resources, hire specialists and pay bills to re… alize this massive project and to set yourself up for expansion. Completing the main campaign is necessary to start the DLC campaign. As soon as the main story has been completed, you'll receive a letter, leading you to the new story hub. Key Features A new campaign (over 30 quests, which lead to about 14 hours of gameplay) Set up your own facility and manage the building process New train options (a new locomotive and a new carriage) New crew options & weapons (new weapon type: shotgun, and additional weapons) New resources & missions System Requirements Windows - Minimum OS: Windows 7 SP1 Processor: 2.5 GHz Dual Core CPU Memory: 4 GB RAM Graphics: AMD Radeon HD 6570, GeForce 9600 GT or higher DirectX: Version 9.0c Storage: 2 GB available space Sound Card: DirectX 9.0c Compatible Sound Card with Latest Drivers Windows - Recommended OS: Windows 7 SP1, Windows 8 (32/64 bit versions), Windows 10 Processor: 2.8 GHz Multi Core CPU Memory: 6 GB RAM Graphics: AMD Radeon HD 6570, GeForce 9600 GT or higher DirectX: Version 9.0c Storage: 2 GB available space Sound Card: DirectX 9.0c Compatible Sound Card with Latest Drivers Mac - Minimum OS: Mac OS X 10.9 Processor: Dual-core Intel or AMD, 2 GHz or faster Memory: 4 GB RAM Graphics: AMD Radeon HD 6570, GeForce 9600 GT or higher Storage: 4 GB available space Sound Card: Any Mac - Recommended OS: Mac OS X 10.10 Processor: 2.8 GHz Multi Core CPU Memory: 6 GB RAM Graphics: AMD Radeon HD 6570, GeForce 9600 GT or higher Storage: 4 GB available space Sound Card: Any © 2015 Daedalic Entertainment GmbH and Corbie Games Limited.Daedalic and the Daedalic-Logo are trademarks of Daedalic Entertainment GmbH.All rights reserved.